DCMs – can they look good AND be computable? Let’s talk about mindmaps and archetypes. Mindmaps seem to be fuzzy and friendly – we need them because they are incredibly efficient at transmitting information to humans. Archetypes seem über-mathematical, but we need them to do proper model-based computing. 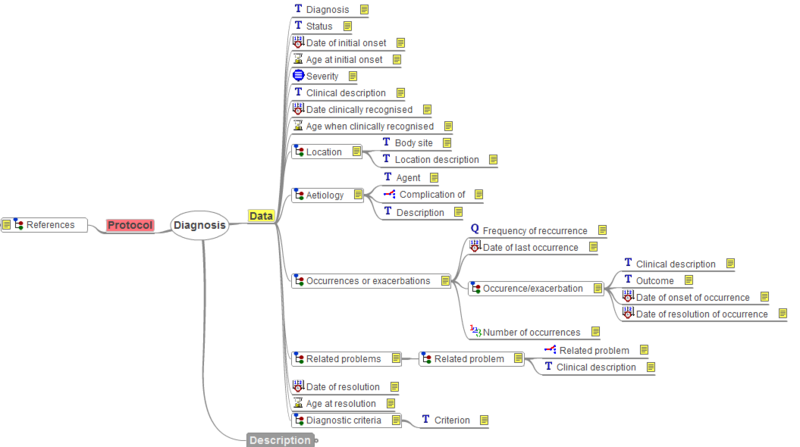 So, contrary to the first bolded statement above, mindmaps can indeed show formal elements – and in a very nice way, suitable both for technical people like me, and clinical people who use these models on a daily basis. Those who look carefully at the UML will realise that the mindmap is abstracting and simplifying just a bit, so as to get the detail / brevity balance right. So let’s not start debating about whether we have to do without formalism in order to communicate models well. We don’t. Further, if we do throw away a proper formal underpinning, mindmaps will go back to being fluffy and relatively meaningless. (And congratulations to the CKM designers for doing such a great design job on CKM mindmap facility). The above leads into my second point: the need for expressivity. As soon as you start trying to define anything realistic in terms of content, involving e.g. patient state, events in time, actions and states, if the DCM framework doesn’t support it you are instantly paralysed. And the DCMs can only support it if they are connected to some formal basis that supplies these things. Without it, authors have to resort to low-level hacking together of simple ‘nodes’ and connectors just to get to first base. These underlying patterns are the key to being able to efficiently author models that will actually be useful in the real world. That means the authoring side of DCM development does need a formal framework. Can authoring be made visually friendly as well? Well it is clearly going to be more complex, but even the existing Archetype Editor, which is not exactly cutting edge technology, does a pretty reasonable job. Koray says above “we may not need a full level of computability” with respect to DCM models. Well, that is were we were in about 1996. The problem is that without the ability to express key structural patterns, types, value ranges, and other details, we were stuck. Have a look at the v1.x draft of the archetype language from 2002 – it gives an idea of what we realised we needed to make any progress. The best content modelling tool of the time was the ‘Object Editor’ from CHIME, UCL. Even back in the mid-90s, it had quite a few ‘formal’ elements, all borne out of getting stuck somewhere in an implementation. The thing about healthcare is that the most banal things, like Glucose Tolerance Test, Orthostatic BP, and Adverse reaction pose serious challenges to computability. We can’t just say, oh let’s leave the computationally hard things till later. Imagine telling a hospital or clinic, sorry, we can’t do OGTT, or any BP with multiple samples, or in fact any time-based data from your ICU devices… let alone typical orders, because we can’t work the state model out. We had to work it out. The many people who have slaved for years in health informatics working out so many things (e.g. the excellent state machine we use in openEHR, taken from Patrice Degoulet’s work, built in turn on the shoulders of…) do so because of this fact: what is simple in health can be seriously difficult to compute. 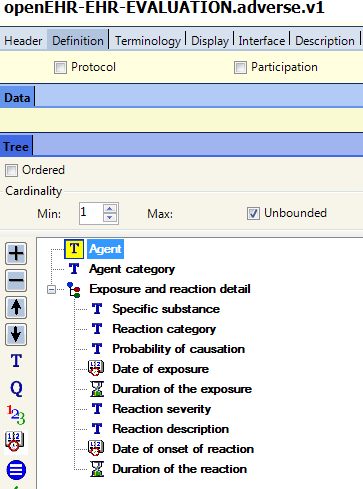 an intuitive model authoring and particularly model reviewing interface. In openEHR, we have made some progress on these; certainly more is needed, particularly on the last point. However, I think doing less is destined for extremely limited progress. This entry was posted in Computing, Health Informatics, openehr and tagged archetype, DCM, e-health, Health Informatics, models, openEHR. Bookmark the permalink. 1 Response to DCMs – can they look good AND be computable? could you tell me how did you create the mindmap graphical diagram?what tool are you using?